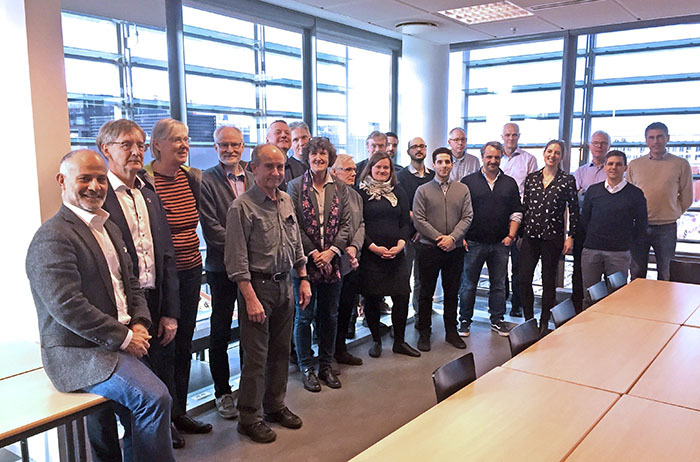 The 7th Task 56 Experts meeting took place at SBI at Aalborg University and KUBEN Management in Copenhagen, Denmark. Besides the regular Task meeting, the event included two excursions, the demo-site visit to the Internationale School in Nordhavnen (see website of C.F. Moller) and to the BIPV Demosite at Technology Institute in Høje Taastrup. 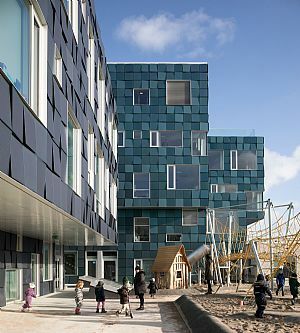 On day two a Task 56 Industry workshop was held at Statens Byggeforskningsinstitut, Aalborg University, where “Task 56” and "Smart Energy Green Cities" invited to an afternoon event about active solar façades. The event was arranged by Vickie Aagesen (KUBEN Management) and Alireza Afshari (SBI, Aalborg University). Following 7 countries were represented at the Task meeting: Austria (2), Canada (1), Denmark (2), Germany (1), Italy (2), Norway (2) and The Netherlands (1). Task 56 Industry workshop at SBI (left) and excursion to "The Internationale School in Nordhavnen" (right). Picture source: M.Meir; C.F. Møller (DK).